Catherine would say it all began in a time that is yesterday and tomorrow and eternally present. But then Catherine’s a storyteller. I’m not a storyteller. I’m just the guy it happened to. Robert is the class victim, the guy who’s never picked for the team. So no one is more surprised than Robert himself when a strange old lady sends him on a quest to solve the mystery of Chance House. Legend has it that a boy fell to his death from an upper window. But what has this past to do with Robert’s future? To get to the truth, Robert must learn what it really means to fly. Feather Boy is simply fabulous… an emotionally intense suspense novel of the highest order. So where did this book come from? Well, I live in Brighton and when I want to think, I walk by the sea. It was April and very cold. I walked for about an hour and actually nothing came in to my head at all. Eventually, I turned inland, up a street called St. Aubyns, and there was this large derelict house all boarded up – except around the back, where the fifteen foot steel mesh had been wrenched off. So I went in. It’s very stupid to go into derelict houses, especially in a town like Brighton which has a big drugs problem. I went right to the top and, in the room next to the one with the blood-stained mattress – I found Feather Boy. Or at least the idea for it. I’ll tell that story later, if we meet maybe. 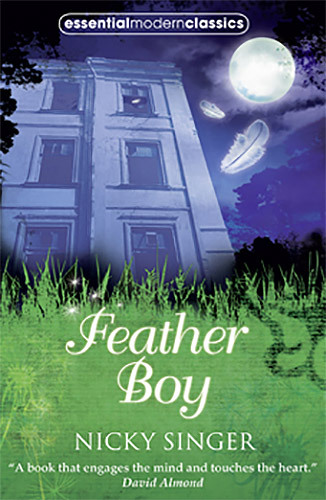 Feather Boy was nominated for the Blue Peter Book Awards 2002. I was thrilled about this because, although the shortlist is drawn up by adults, the actual winner is chosen by children. 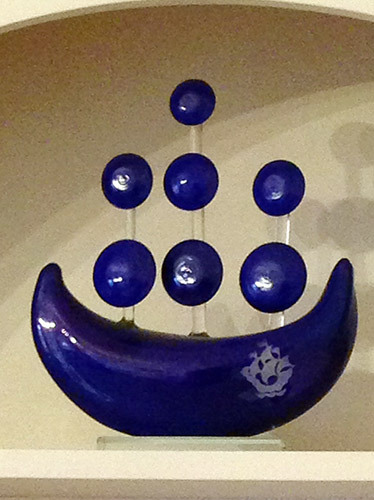 I was also thrilled because it allowed me to go to the Blue Peter Studio, which had been my ambition since I first sent Val Singleton a plasticine alien about 40 years ago… Anyway I went with all my Blue Peter badges on (yes, I still have them all in my jewel box – how sad is that? ); I have an ordinary one (for the plasticine effort), a silver one (for some letter I wrote about a rabbit) and two Blue Peter Annual competition badges. The producer called me a Blue Peter Nerd. Then when they announced I’d won the Book I Couldn’t Put Down category– I couldn’t believe it. I got up and thought I was going to make a speech, but mainly cried. Then I sat down and heard the Chairman of the adult judges, Ian Hislop, say now they were going to award the Book of the Year. I didn’t actually know there was an overall winner and I remember thinking, ‘Crumbs, I hope I don’t get that because I’ve shot my bolt on speeches already’. But then I won anyway. I got two huge ships made of glass and did some more crying. Then – guess what, the producer actually gave me a new-modern day Blue Peter Badge. Hooray! That’s in my jewel case now too.